This machine wraps light weight negative plates with AGM separator material and then stacks them with positive plates into battery cells. 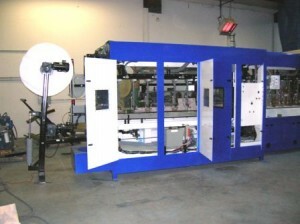 The system uses a servo operated AGM separator feed, crease and cut system. The negative plates are removed from a stack using a pick and place system. The AGM material is wrapped around the plate. 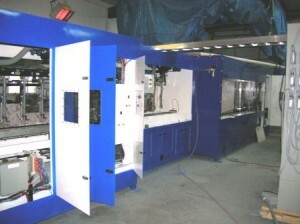 The negative plates, with wrap, are indexed using a shuttle system. There are 8 positive plate pick and place stacking feeders, two of which supply the thinner positives for the cell edges. The cells exit on a flat conveyor for manual or automated assembly and further use. The process continues as long as product is available.